The despatch of 1,975 Canadian volunteers on October 27, 1941, to the Pacific front attracted little attention in Canada.3 Mention in the national press of Canadian forces in the battle of Hong Kong occurred in a small column in the Toronto Daily Star on December 8, 1941.4 Official Canadian historian of the Second World War, C.P. Stacey, has stated that the history of the Canadian Army is chiefly concerned with the campaigns of the Western Allies against Germany more than the war against Japan in the Pacific.5 This statement is quite understandable given that, by 1941, Canada had spent considerable time and resources in building a large field artillery in the U.K. How ironic it is, then, that “although Canada directed its primary war effort against Nazi Germany the first major battle fought by the Canadian army was not in Europe, but in the Far East.”6 This paper will turn its attention away from the campaigns and public memories associated with Germany during World War II, and focus on the part played by two Canadian infantry battalions sent to the Pacific. In 1941, the Canadian government despatched two battalions, namely, The Royal Rifles of Canada and the Winnipeg Grenadiers, designated as ‘C’ Force, to Hong Kong. While the experiences of both battalions were intertwined, due to space limitations this paper will concentrate more on the Royal Rifles of Canada. However, material that covers prisoner of war experiences and challenges faced upon liberation are representative of both battalions. Furthermore, this paper will not cover the experiences of the two Canadian nursing sisters who accompanied ‘C’ Force, nor will it address the unique experiences of those higher authorities and commanding officers. Historian, Daniel Dancocks, has stated that Canadian prisoners of war are the “forgotten men of World War II, in that much has been written that glorifies military efforts but neglects prisoners of war.”8 New social histories have recently emerged that focus on ordinary men who did extraordinary things under extraordinary circumstances. Through the examination of diaries and memoirs the question will be asked: “What is the experience of being a prisoner of war?” This paper will add to existing scholarship on prisoners of war and focus specifically on the shared experiences of prisoners of war incarcerated in Hong Kong and Japan. Furthermore, public memory associated with the prisoner of war experience of our Hong Kong veterans will be addressed to show a shift in attitudes as numbers of remaining Hong Kong veterans dwindle. Most scholarship covering the battle of Hong Kong ends with a final chapter covering liberation in 1945. Historians are not unique in this, as many ex-prisoners of war, upon describing their experiences through published memoirs, often end their account with a final note declaring: “the rest is history.”9 While the rest is history, it is a history largely undocumented by historians or veterans. This paper will analyze primary and secondary resources to address some of the challenges faced by the ex-POWs once they returned home to reveal why some wounds take longer to heal than others. Each and every year on November 11, Canadians stop for a moment of silence to honour those who have laid down their lives; the ‘ultimate’ sacrifice paid in the name of freedom. This paper will conclude by asking the question: “How have we honoured or recognized those soldiers that did not pay the ‘ultimate’ sacrifice of their lives on the battlefield?” The subject of public memory and recognition, as it pertains to the ex-POWs of Hong Kong will be examined and it will be shown that there are many who have dedicated considerable time and energy in making sure that Canadians remember the strength and fortitude of those men who served and endured Hong Kong, and that their sacrifices remain a lasting testament that all sacrifice in the name of freedom deserves to be recognized. The training policy required a full sixteen weeks of training before despatch to any front. The subject of ‘training,’ with respect to the two battalions sent to Hong Kong, has been the source of much spilled ink and controversy. The first rumblings of concern questioning the training of the men sent overseas occurred after the fall of Hong Kong in December of 1941, by George Drew, Ontario Conservative Leader, leading to the appointment of a Royal Commission in February of 1942. The standard of training of the men was one of the primary topics considered during the Royal Commission, commonly referred to as the Duff Commission. Historians, many decades later, continue to address the subject of training and make their own conclusions as to whether the training these men received hindered their performance during the seventeen days of battle or not. As the subject of training has been a source of controversy through the years, equal scholarship and debate surrounds the government’s decision to send the battalions it did. After a number of exchanges, the Dominion Office cabled Ottawa with respect to Hong Kong requesting a small reinforcement of the garrison of Hong Kong by “one or two battalions,” to increase the current strength of the garrison, provide a moral effect in the Far East and reassure Japan as to the intent of holding Hong Kong.12 Then Acting Minister of National Defence, Major Power, testified at the Duff Commission that “I do not think there was ever any question really or any discussion […] as to any reason why we should not take it on. It struck me as the only thing to do.”13 The difficulty the government faced was not over the question of sending the battalions, as Ottawa depended on London for intelligence information, but over which battalions it should send. On September 24, 1941, the Director of Military Training, J.K. Lawson, prepared infantry lists of battalions in Canada breaking the battalions into groups of 1) best-trained, being designated ‘A’ group, 2) next best trained, ‘B’ group, and 3) “due to either recent employment requiring a period of refresher training or to insufficient training, are not recommended for operational consideration at present, ‘C’ group.14 There was opposition among military leaders in sending sufficiently trained troops, ready for England, for guard duty in the Pacific.15 As the task of the Hong Kong garrison was to defend the Colony against attack and deny the use of the harbour, General Crerar, Chief of the General Staff in Canada, recommended the Royal Rifles of Canada and the Winnipeg Grenadiers. Crerar, later testifying at the Duff Commission, outlined his decision to recommend the Royal Rifles and the Winnipeg Grenadiers to “adhere to the principal of territorial representation,” with both Eastern and Western Canada being fairly represented.16 Furthermore, he felt that their previous garrison duty experience was “not in many respects unlike the task which await[ed] them in Hong Kong.” 17 The benefit of hindsight should not allow one to dwell upon the obvious paradoxes. Thus, on the 27th of October, 1941, 1,975 Canadians, commanded by Brigadier J.K. Lawson, boarded the Awatea, with one company of the Royal Rifles on board the armed merchant cruiser, HMCS Prince Robert, and set sail for the Far East. On 6 November 1941, the Japanese Imperial Headquarters ordered the China Expeditionary Army to prepare to attack Hong Kong with the objective to “neutralize air power and destroy vessels and installations,” with a main attack occurring on the north shore of Hong Kong Island.21 Canadian medical historian, Charles Roland, points out that there is no suggestion that “only the Japanese, or only the Axis powers behaved brutally during WWII, […] however, inhumane and brutal treatment occurred in Far Eastern POW camps; that statement needs no further documentation.”22 Unfortunately, Japan had made no preparations for feeding and housing some 11,000 prisoners of war, “as the concept of so many surrendering was simply inconceivable to them.”23 A brief outline of the Japanese Imperial Army and Japanese culture in the World War II context is necessary for a better understanding of the events that followed. The word ‘bushido’ occurs many times in accounts of the war in the Pacific.24 Bushido is a Japanese cultural phenomenon providing guidelines to appropriate Japanese behaviour on the battlefield, and is solely concerned with relations between samurai and their conduct in battle.25 Samurai were to have no relation with the enemy and women and children were not to be protected, as witnessed in other countries. Furthermore, the concept of ‘surrender’ and being taken prisoner was different from that in Europe, Canada and the United States. Minister of War, Tojo Hideki, testified on his own behalf concerning the philosophy of being taken prisoner during the war crimes trials following the war: “In Japan [being taken prisoner] is a disgrace. Under Japanese criminal law, anyone who becomes a prisoner while still able to resist has committed a criminal offense, the maximum penalty for which is the death penalty.”26 Surrendering during war was directly related to that of dishonour, bringing shame to one’s own family, government and nation.27 Deep-rooted cultural differences between Japan and Canada during the War added to the difficulty of Western prisoners trying to make sense of the brutality and inconsistency of their Japanese captors. A period of three weeks lapsed from the time the Canadians landed in Hong Kong, after a long sea voyage, to the time the Japanese first attacked the mainland. This was a severely short period of time to acclimatize to the weather, food, time change and terrain, before being thrown into full-scale battle. Stacey points out that, “the extraordinarily rugged terrain of Hong Kong was one of the hardest battlefields on which Canadians fought in any theatre.”28 A British soldier, commenting on this short period of acclimatization, noted in his diary: “Poor devils! Straight from guard duties in the West Indies & Canada they had not a clue about H.K. terrain and were pitch forked into the battle almost before they knew which was the Island and which was mainland.”29 The series of disasters which marked the opening months of the war with Japan were unprecedented and disorienting at best. Official accounts written by company officers during the battle were destroyed shortly before surrender, for fear of coming into the hands of their captors. Any ‘primary’ material available to historians was written by memory, months or sometimes years later, while prisoners of war and are often fragmented, contradictory and confusing. There are many excellent scholarships available that have outlined the battle in extensive detail. Canadian historian, Tony Banham, has produced an hour-by-hour and often minute-by-minute account of the battle in his book, Not the Slightest Chance. Extensive coverage of the battle is beyond the scope of this paper; however, a broad outline will be provided, focusing mostly on the movements of the Royal Rifles of Canada during the battle. 1. Loss of Mainland: In the days leading up to the attack, Brigadier J.K. Lawson recorded in his diary, “’news’ says war in fortnight. Hope our transport arrive.”35 Transport did not arrive as hoped when, on 7 December 1941, the Royal Rifles of Canada, situated on the Island, received orders from Island Brigade Headquarters to “stand to.”36 On Monday, December 8, at 4:45 a.m. local time, Major Charles Boxer, of Fortress Headquarters in Hong Kong, heard on a Tokyo broadcast “instructions in code to their nationals that war was imminent with Great Britain and America.”37 Everyone was alerted. At the same time the Japanese prepared to attack Hong Kong, other Japanese forces were attacking in the Philippines, Malaya and Hawaii. Civilians of Sham Shui Po and Kai Tak are awoken at 8:00 am by the loud crescendo of an air raid warning. Japanese bombers could be seen overhead diving down to drop their payload on strategic targets. No units or sub-units of the Royal Rifles were on the mainland throughout this period of attacks. Within 36 hours of the initial attack, the major line of defence, the Gin Drinkers Line, had been broken. Within five days the Japanese Army had absolute control of the mainland, leading to the decision of General Maltby, General Officer Commanding British Troops in China, on the afternoon of 12 December, to “withdraw all remaining troops to the island immediately.”38 The initial defence of Hong Kong had not begun well. 2. Seige of Island (December 13-18) : In the early morning of December 13, the first Japanese demand for surrender is written by Lieutenant General Sakai and delivered to the Governor of Hong Kong, Mark Young, informing him that “my artillery and air force, which are ready to crush all parts of the Island, now await my order.”39 Saiko’s message further notes that unless negotiations for surrender begin immediately, “further resistance will lead to the annihilation of a million good citizens.”40 Governor Young replied, in short, that no meeting or parley would be held on the subject of surrender.41 True to their word, massive artillery and aerial bombardment resumed fall both day and night. Sgt. Lance Ross, of the Royal Rifles of Canada, recorded the bombardment in his diary on December 16th: “heavy shelling all day – expect attack at anytime.”42 Elsewhere, on the 16th of December, Governor Young had received his second formal request for surrender by the Japanese Military and Naval Authorities. Once again, Young rejected any request for surrender. Sgt. Ross’ premonitions were correct, as two days later, at 21:00 hours, the first wave of Japanese soldiers landed on the Island. 3. Invasion of the Island (Dec. 18-25): On December 18th, Rifleman Sydney Skelton, recorded the following in his diary: “This day has been the worst yet. Our position has become a living hell. My nerves are on edge. I could eat a horse.”43 Skelton had no possible way of knowing the extent to which his living hell would soon unfold. Once the Japanese landed in Hong Kong, “it was sheer chaos.”44 ‘Chaos’ is what many diaries, memoirs and historical accounts refer to during the invasion of the Island by the Japanese. A full detailed account of the activities covering the 18th to the 25th is beyond the scope of this paper. Many scholarships have meticulously covered the final battle in great detail. What will be highlighted will be common experiences shared by many Canadian soldiers held up in various locations on the Island. A number of commonalities were that of chaos, exhaustion, poor communication, and casualties. Ken Cambon, of the Royal Rifles, recalled the confusion while awaiting orders. On December 18th, Lieutenant G.M. Williams’s and J.E.D. Smith’s platoons of C Company Royal Rifles, were ordered to occupy Mount Parker to block the Japanese advance.45 Cambon later recalled the events of that day: “As I remember, we seemed to spend the day climbing hills, not knowing where we were, receiving conflicting orders and always being shot at by someone.”46 Historian, Brereton Greenhous, addresses the subject of chaos in modern battles when he states: “All battles […] inevitably become confused and chaotic affairs as clashing wills and failing technologies generate all kinds of friction.”47 The metaphor ‘fog of war’ is often used to describe the confusion and chaos that exists in battle. Adding to the confusion and chaos, communication systems were in a complete state of disorder. The Royal Rifles of Canada Regimental history records how Brigadier Atkinson, when as Adjudant of the Royal Rifles, attempted to reach Island Headquarters by telephone and found himself “talking to a Jap who spoke broken English.”48 Communication problems existed throughout the entire battle and it was difficult for Headquarters to keep contact with sub-units. “C” Company, of the Royal Rifles of Canada, War Diary made note of the state of the men dug in: “None… had had a hot meal for five days owing to the destruction of the cooking arrangements. They have been doing continuous manning for over a week with no chance to sleep but in weapon pits.”49 Further records revealed the physical condition of the battalion by December 22: “All ranks … were thoroughly tired out after the continuous movements of the preceeding days. Lack of sleep, climbing hills through difficult trails, preparing defensive position, irregular and in some cases very meagre meals, all contributed to this condition.”50 This heightened sense of exhaustion did little to help the mounting friction between British and Canadian Commanders. The exhaustion was so great at times that Lt-Col. Home, Commander of the Royal Rifles of the East Brigade on the Island, was willing to risk his military career by insisting that the Regiment be relieved on December 24 against the wishes of his immediate superior, “otherwise he would not be responsible for what would happen.”51 His battalion was dead tired and he felt further resistance would only result in the wasting of valuable Canadian lives.52 Relief was granted but cut short due to further determined attacks by the Japanese. In the hours leading up to the surrender, casualties rapidly mounted. Brereton Greenhous, referring to memoirs written by ex-prisoners of war from Hong Kong, has cautioned that some memoirs contain “uncertain recollections of those who survived, some assembled during a malevolent captivity, some in the immediate aftermath of war, others long afterwards from memories embittered by injustice, embellished by time, or embroidered by both.”67 Greenhous further notes that “while this may be true of the battle, as accounts vary due to the destruction of the original official records, there is little variation in the accounts of deprivation [and] punishment […] experienced while prisoners of war.”68 Over the past decade the voice of ex-prisoners of war, and their harrowing experiences, has slowly begun to emerge from the deep and hidden corners of their hearts and minds. The diary of Rifleman Henry Lyons, of the Royal Rifles of Canada, gives one possible explanation for the silence of so many Hong Kong veterans for so long when he recorded: “if we ever get out of here, there will be no use to tell our people, as it was so bad you wouldn’t expect anyone to believe that human beings could be so cruel.”69 Several scholarships have focussed on the experiences of Canadians in Hong Kong and Japanese prisoner of war camps. Many other scholarships that provide details of the battle also identify specific details of prisoner of war life in great detail, including day to day activities and meticulous descriptions of the environment in which they were set. This paper will focus on experiences that were common to most, and often all, POWs in prison camps in Hong Kong and Japan. The shared experiences that will be discussed will be: emasculation, work, brutality, resistance, morale, sameness, starvation and disease. Articles 2 and 3 of the Geneva Convention relative to the treatment to prisoners of war, signed in 1929, states: “Prisoners of war […] shall at all times be humanely treated and protected, particularly against acts of violence, from insults and public curiosity.”70 While the Geneva Convention on the treatment of POWs was often ignored in one fashion or another by many countries during the Second World War, Japan was unique in that the Japanese had signed but not ratified in its own parliament the document. Thus “Japan had no legal obligation in international law to follow the precepts of that particular Convention.”71 The cruel and harsh treatment of prisoners of war by the Japanese guards led to a six times higher death rate than those held captive elsewhere.72 For most Canadian soldiers serving during the Second World War, 1942 marked the beginning of their battle experience while, for the Canadian soldiers at Hong Kong, their fighting days had already ended and the nightmare of nearly four years of captivity had begun. POWs were repeatedly subjected to being slapped harshly on the face for any reason whatsoever. In describing the affect of this, one soldier recalled: “It’s pretty hard to take. It’s probably worse than being punched.”81 The importance of cigarettes helped neutralize possible threats to masculinity. In the 1940s, cigarettes were often regarded as a symbol of manliness. Roland states that “if smoking cigarettes conveyed an aura of manliness, who needed that support more than men who had been defeated and captured by the enemy.”82 Despite frail and weakened emasculated bodies, the hard physical labour that these men miraculously performed, sick or not, while incarcerated, would have helped ease any possible worries surrounding their gender identity. Accounts of prisoner of war experiences, either written in POW camps or recorded decades later in memoirs, all document the personal or witnessed harsh and brutal treatment of their Japanese captors. St. Ross recorded in his diary on April 26, 1943: “I got beat up by Jap Sgt. Cut my lip and tried to knock me down and I couldn’t even hit back…”94 Many choose not to focus on their own suffering but on that of their fellow comrades. John R. Stroud, of the Royal Rifles of Canada, recalled the fatal beatings of Rifleman Reginald Haley for not going fast enough at work.95 Few ex-prisoners did not make mention of the worst case of brutality either witnessed, or later recounted, at the war crimes trial, namely the torture and subsequent death of James Mortimer of the Royal Rifles of Canada. George Dixon of the U.S. Navy, and fellow prisoner, testified at the war crimes trial that Mortimer and American prisoner, Gerald Titman, were accused of stealing a can of salmon from Japanese stores. Mortimer and Titman were “strung by their thumbs and the ropes adjusted over the rafter to keep them on tip-toe. Then they were tied to an outside gatepost in freezing weather and left there for seven to ten days. They were beaten and kicked regularly by passing guards.”96 Both men died within days of being cut free. The bitterness and trauma associated with the atrocities that occurred at St. Stephens College in 1941 were still seen 50 years later in an interview with Bob Clayton in the National Film Board of Canada’s production of the documentary, The Valour and the Horror. Clayton, while visiting the site where the massacres occurred, shook his head and said, “what those bastards did in here, I’ll never forget.”97 Memories still remain of how the makeshift emergency hospital was overrun by approximately 150-200 Japanese soldiers who broke into the hospital where they stabbed to death helpless patients and raped, mutilated and murdered women nurses. Captain James Barnett, chaplain of the Royal Rifles, recorded being witness to fifteen or twenty wounded soldiers lying in beds being bayoneted by Japanese soldiers.98 When the slaughter ended, survivors were put to work to clean up after the massacre. Men also exercised their agency during work projects, as recalled by Bob Clayton. He remembered that work plans for the creation of a new runway at the Kai Tak airport were foiled when work parties sabotaged efforts by mixing “all kinds of stuff” in the cement.101 Being involved in underground operations was also a means of exercising one’s agency. One such underground operation began as prisoners heard rumours of mass executions if Allied forces invaded. At Omine Prison Camp in Japan, Sgt. Ross and Company Sergeant-Major Frank Ebdon were part of an underground operation that worked to prepare maps of the area and secure 800 sticks of dynamite from the mine where they worked, to smash their way out of camp upon word of Allied invasion.102 The Japanese later discovered the maps and forced Ross, Ebdon and six senior NCOs to remain standing for 36 hours straight, while they were, in turn, interrogated. Ross recorded the event in his diary: “Got out today, stood up all that time. Didn’t think it possible.”103 Ross, and many others like him, would continue to prove to themselves, time and time again, that despite all odds, anything was possible! Canadians were shielded from being greeted by the emaciated, skeletal frames of their returning prisoners of war from Hong Kong and Japan, as it took one to two months for repatriation, by which time most of the ex-prisoners had gained back the weight they had lost while captive. Showing little external signs of their years of deprivation, it is easy to see how the return of over 1400 prisoners of ‘C’ Force, from the Pacific, at the end of the war was largely overshadowed by the hundreds of thousands returning home from Europe.133 An article in the Montreal Gazette draws attention to another reason why these men have, in past, been referred to as “the forgotten heroes of WWII.”134 The article explains how their attitudes toward what they endured can be seen by one soldier’s comments after the war: “I don’t want to talk about Jap treatment or brutality, it’s over and I want to forget it.”135 It would be decades before their voices would trickle onto the written pages of history so that all Canadians would know and never forget the emotional and physical trauma experienced by Canadian volunteers while in the service of their country. Despite the initial homecoming fanfare and celebrity status, as recalled by George McDonell, there lurked, hidden amongst the overriding rapture of rediscovered freedom, fear and trepidation.137 One Canadian prisoner expressed the worries and anxieties about freedom in a letter to his friend. He wrote: “I can’t help but think of all the things we are going to have to learn before we feel at home. Will we feel lost, frightened by the things we see?”138 Many did have difficulty adjusting to the early days of freedom as life in captivity was still fresh in their minds. 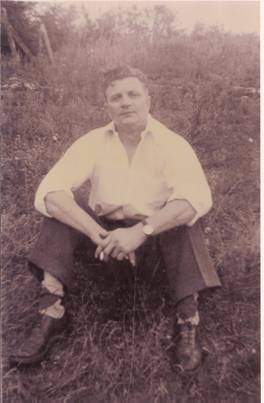 In a report documenting the physical and psychological experiences of the prisoners of war, it was noted that the adjustment to home life was so difficult because the expectations of families and friends had been too great.139 Ken Cambon addressed this very topic when he noted that readjusting to freedom seemed harder than the years in prison camp as, “the only goal was to survive” while a prisoner of war.140 Cambon recalled that it was much more difficult to adapt to family patterns which were expected of him.141 Readjusting to family life and expectations was just part of the uphill battle these men would face throughout their lives. One of the first of many hurdles the ex-prisoners of war had to face was in dealing with the Canadian government and bringing proper justice upon those who had been accused of committing war crimes in the Pacific. Those captured and accused of war crimes numbered approximately eight times more than those accused in Europe.142 Whether sufficient justice was served is a matter of contention, as the American policy of clemency in 1950 reduced many prison sentences.143 While many veterans were vehemently opposed to clemency, there was no outcry of public support, as attentions had been turned to the mounting tensions between the United States and the U.S.S.R.
Canadian ex-POWs from Hong Kong, and their posterity, have been world-wide leaders in the effort to convince reluctant governments to award pensions appropriate to service and to conditions experienced.151 Nowhere is this more evident than in one of their final conflicts. In 1987 the War Amputations of Canada, in association with the Hong Kong Veterans Association of Canada, submitted an extensive claim to the United Nations Commission on Human Rights, with respect to the gross violation of human rights committed by the Japanese for the incarceration of Canadian Servicemen in Hong Kong and Japanese prisoner of war camps during the Second World War.152 The initial goal of the submission, based on a gross violation of human rights, was to receive compensation from the Japanese government for the forced labour performed while prisoners of war. Roadblocks, such as the 1952 Peace Treaty that absolved Japan of any responsibility, were not enough to thwart the efforts of the veterans and their supporters. In 1993, fed up with the Canadian government’s unwillingness to negotiate with Japan to pay reparations, the veterans proposed that the Canadian government pay their compensation claim.153 The list of supporters for the Hong Kong veterans, by this time, had grown significantly. As veterans, and supporters alike, were gearing up to take on the Canadian government, citizen ‘enlightenment’ of the situation was needed to acquire the much needed public pressure. Subsequently, a documentary produced by H. Clifford Chadderton, of the War Amputations of Canada, and Patron of the HKVA, was prepared for the Canadian public, titled “Canada’s Hong Kong Veterans—The Compensation Story.”154 The response of the Canadian public was as favourable as hoped. The Globe and Mail picked up the story and reported on 16 August 1993: “Human-rights expert urges compensation for Canadian PoWs.” The article quotes John Humphrey, a long-time head of the United Nations Human Rights Directorate: “Canada will be tarred […] for its refusal to press for negotiation of one of the shameful legacies of the Second World War.”154 The article also scolds the Canadian government for turning its back on POWs. Of the original 1,418 survivors of ‘C’ Force, only 350 of them would have been fortunate enough to see the fruits of their labours come to fruition in 1998 by the awarding of $24,000 to each surviving Far East POW, or to their widow, for the forced labour endured while prisoners of the Japanese. CBC News, on 12 December 1998, heralded the success of Canada’s Hong Kong veterans, but also reminded Canadians of the grievances they still harbour in never receiving a formal apology from the Japanese government for the suffering they endured while held captive during the war.155 Dollars can never fully compensate for the sacrifices made at Hong Kong, and there will always be those who argue ‘what has been has been.’ Argument and recrimination will do nothing to repair the damage, nor will it mitigate any of the hardships of those young Canadians who fell prisoners to the Japanese. There have been many different forces that have affected the public memory of the battle of Hong Kong over the years. What is interesting to note is the change in public perception, and, in many instances, the creation of a public memory, from the time survivors returned home until the present. Initial perceptions about the war centred around the comments of Doddridge. Doddridge recalled that “when we first returned to Canada, it was widely believed that we were losers, which, in a sense we were.”158 Losers or not, those who returned home were not anxious to change public perceptions that focused on defeat, as energies were turned elsewhere. With only 114 remaining Hong Kong veterans as of March, 2008, there is a growing concern among veterans that their sacrifices will be forgotten. Many family members of those who served in the Far East feel it is their duty to make sure their memories live on, as seen by the formation of the Hong Kong Veterans Commemorative Association (HKVCA). Formed in 1995, a group of sons and daughters of veterans banded together to assist aging veterans and widows. They have also worked tirelessly to create a greater public awareness of the heroic role the soldiers played in the defence of Hong Kong and the hardships they faced for nearly four years while prisoners of war. While the passing of time should not erase or overlook historical accounts in lieu of those presented in the “softer light of revision,”160 “what they suffered, and their spirit of courageous endurance, out to be remembered forever in their honour.”161 One such initiative to ensure that the battle of Hong Kong remain in the public eye has been undertaken by the HKVCA, in fulfillment of their promises made to the Veterans, that Canadians who fought in Hong Kong, and what they experienced, would not be forgotten. 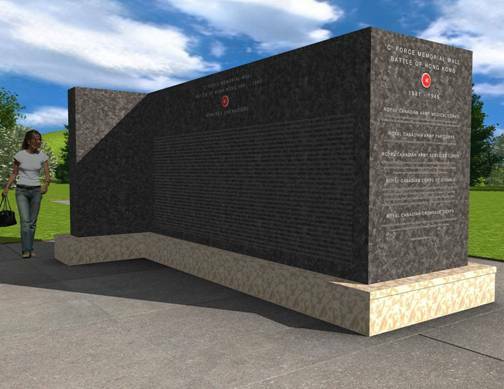 The creation of a lasting memorial has been approved, in principle, which would see the construction of a ‘C’ Force Memorial Wall to serve as a tribute to those 1,975 Canadian volunteers who were sent to assist the British in defending against the Japanese invasion. This memorial is scheduled for completion in 2010 and will be situated on National Capital Commission property located in Ottawa with easy public access. Public support has been strong, as donations have poured in from agencies, corporations, friends and supporters, as well as the veterans and their families. Bob Clayton, concluded the documentary with words spoken directly to his fellow comrades, when he said: “Wherever you are, and wherever you go, you can say: ‘I’m a Hong Kong Veteran,’ and hold your head up high.”162 We, too, as Canadians can walk with our heads held high knowing that we are the beneficiaries of their sacrifices and that the memorial wall will serve as a lasting testament recognizing all sacrifices in the name of freedom. 1 Phil Doddridge, “Memories Uninvited,” Home Page, Retrieved February 13, 2008 from the World Wide Web: http://www.geocities.com/phil_doddridge/. 2 Veteran Affairs Canada, “The Purpose,” Veteran Affairs Canada. Retrieved February 23, 2008 from the World Wide Web: http://www.vac-acc.gc.ca/CLIENTS/sub.cfn? 3 Carl Vincent, No Reason Why: The Canadian Hong Kong Tragedy—an Examination (Stittsville, Canada’s Wings, Inc., 1981): 2. 4 Staff Writer, “Canadian Units Fight Air Raid at Hong Kong,” Toronto Star: Pages of the Past, 8 December 1941, Front Page. Retrieved March 20, 2008 from the World Wide Web: http://www.micromedia.pagesofthepast.ca.proxy.library.carleton.ca. 5 Charles P. Stacey, Official History of the Canadian Army in the Second World War, Volume 1: Six Years of War (Ottawa, Edmond Cloutier, 1955): 437. 6 Daniel G. Dancocks, In Enemy Hands: Canadian Prisoners of War 1939-45 (Edmonton, Hurtig Publishers Ltd., 1983): 220. 7 Terence and Brian McKenna (writers), “Savage Christmas: Hong Kong 1941” Television Documentary: The Valour and the Horror, Story by D’Arcy O’Connor, National Film Board of Canada, 1992. 8 Daniel G. Dancocks, In Enemy Hands, ix. 9 Tom Forsyth Diary, “Hong Kong Diary and Memories of Japan,” Library and Archives Canada (LAC), Ottawa, File #MG30, E181. 11 Ken Cambon, Guest of Hirohito (Vancouver, PW Press, 1990): 3. 12 Oliver Lindsay, The Battle for Hong Kong, 1941-1945: Hostage to Fortune (United Kingdom, Tempus Publishing Ltd., 2005): 55. 13 LAC, Ottawa, File #RG 33-120 Volume 2, “Duff Commission,” Testimony of Major Power, Minister of National Defence. 14 C.P. Stacey, Six Years of War, 442. 15 Daniel G. Dancocks, In Enemy Hands, 221. 16 LAC, Ottawa, File #RG 33-120 Volume 2, “Duff Commission,” Exhibit 13: Letter written by Major-General Crerar to Minister of National Defence on 30 September, 1941. 17 C.P. Stacey, Six Years of War, 442. 18 Tony Banham, Not the Slightest Change: The Defence of Hong Kong, 1941 (Hong Kong, Hong Kong Press, 2003): 9. 19 William Allister, Where Life and Death Hold Hands (Toronto, Stoddart Publishing Co. Ltd., 1989): 14. 21 Tony Banham, Not the Slightest Change, 9. 22 Charles G. Roland, Long Night’s Journey into Day: Prisoners of War in Hong Kong and Japan, 1941-1945 (Waterloo, Wilfrid Laurier University Press, 2001): 305. 23 Dave McIntosh, Hell on Earth: Aging Faster, Dying Sooner – Canadian Prisoners of the Japanese During World War II (Toronto, McGraw-Hill Ryerson Ltd., 1997): 117. 24 Charles G. Roland, Long Night’s Journey into Day, 304. 28 C.P. Stacey, Six Years of War, 490. 29 Charles G. Roland, Long Night’s Journey into Day, 11. 30 C.P. Stacey, Six Years of War, 489. 33 Terry Copp, “The Defence of Hong Kong: December 1941,” Canadian Military History. 10:4 (Autumn 2001): 18. 34 C.P. Stacey, Six Years of War, 440. 36 Hong Kong Veterans’ Association, The Royal Rifles of Canada in Hong Kong, 1941-1945 (Carp, Baird O’Keefe Publishing Co., 2001): 43. 37 Oliver Lindsay, Hostage to Fortune, 67. 38 C.P. Stacey, Six Years of War, 468. 39 Tony Banham, Not the Slightest Change, 69. 43 Oliver Lindsay, The Lasting Honour: The Fall of Hong Kong, 1941 (London, Hamish Hamilton Ltd., 1978): 83. 44 Tony Banham, Not the Slightest Change, 97. 46 Ken Cambon, Guest of Hirohito, 19. 47 Brereton Greenhous, “C” Force to Hong Kong: A Canadian Catastrophe, 1941-1945 (Toronto, Dundurn Press, 1997): 71. 48 Hong Kong Veterans’ Association, The Royal Rifles of Canada in Hong Kong, 65. 52 Tony Banham, Not the Slightest Change, 194. 53 Tom Forsyth, “War Diary & Memoirs,” LAC, Ottawa, File #MG30, E181, Recorded after the fighting finished on December 25, 1941. 54 Lancelot Ross, “War Diary,” Diary entry made on December 20, 1941. 55 Ken Cambon, Guest of Hirohito, 30. 56 George MacDonell, This Soldier’s Story: 1939-1945 (Carp, Baird, O’Keefe Publishing, Inc., 2001): 44. 57 Oliver Lindsay, The Lasting Honour, 143. 59 Daniel G. Dancocks, In Enemy Hands, 225. 60 C.P. Stacey, Six Years of War, 488. 61 LAC, Ottawa, File #RG 33-120 Volume 2, “Duff Commission,” February, 1942. 62 Terence and Brian McKenna (writers), The Valour and the Horror, Story by D’Arcy O’Connor, National Film Board of Canada, 1992. 63 Terry Copp, “The Defence of Hong Kong: December 1941,” Canadian Military History. 10:4 (Autumn 2001): 5. 64 Ken Cambon, Guest of Hirohito, 43. 65 Carl Vincent, No Reason Why: The Canadian Hong Kong Tragedy, 249. 66 George MacDonell, This Soldier’s Story: 1939-1945, x. 67 Oliver Lindsay, Hostage to Fortune, 144. 69 Henry Lyons, 1986 Interview, in Gustave Gingras and Carol Chapman, “The Sequelae of Inhuman Conditions,” Appendix E, LAC MG31 J12, Volume 12. 71 Charles G. Roland, Long Night’s Journey into Day, xvi. 72 Terence and Brian McKenna (writers), The Valour and the Horror, Story by D’Arcy O’Connor, National Film Board of Canada, 1992. 73 Charles G. Roland, Long Night’s Journey into Day, 46. 74 Hong Kong Veterans’ Association, The Royal Rifles of Canada in Hong Kong, 93. 76 Charles G. Roland, Long Night’s Journey into Day, xvi. 77 William Allister, Where Life and Death Hold Hands, 44. 78 Larry May, Robert Strikwerda & Patrick Hopkins (eds. ), Rethinking Masculinity: Philosophical Explorations in Light of Feminism (2nd ed., Maryland, Rowman & Littlefield Publishers, Inc.,) 108. 79 William Allister, Where Life and Death Hold Hands, 92. 80 Charles G. Roland, Long Night’s Journey into Day, 115. 81 Eugene Matchett, 1986 Interview, in Gustave Gingras and Carol Chapman, “The Sequelae of Inhuman Conditions,” Appendix E, LAC MG31 J12, Volume 12. 82 Charles G. Roland, Long Night’s Journey into Day, 102. 84 Brereton Greenhous, “C” Force to Hong Kong, 129. 85 Tom Forsyth, “War Diary & Memoirs,” LAC, Ottawa, File #MG30, E181. 86 Clifford McDavid, 1986 Interview, in Gustave Gingras and Carol Chapman, “The Sequelae of Inhuman Conditions,” Appendix E, LAC MG31 J12, Volume 12. 87 Lancelot Ross, “War Diary,” Diary entry of ???. 90 Dave McIntosh, Hell on Earth: Aging Faster, Dying Sooner, 209. 94 Lancelot Ross, “War Diary,” Diary entry of ???. 95 John Raymond Stroud, 1986 Interview, in Gustave Gingras and Carol Chapman, “The Sequelae of Inhuman Conditions,” Appendix E, LAC MG31 J12, Volume 12. 96 McIntosh, Hell on Earth: Aging Faster, Dying Sooner, 207. 97 Bob Clayton, The Valour and the Horror, Terence and Brian McKenna (writers). 98 Brereton Greenhous, “C” Force to Hong Kong, 114. 99 Lancelot Ross, “War Diary,” Diary entry of ???. 100 Oliver Lindsay, The Lasting Honour, 187. 101 Bob Clayton, The Valour and the Horror, Terence and Brian McKenna (writers). 102 Dave McIntosh, Hell on Earth: Aging Faster, Dying Sooner, 144. 103 Lancelot Ross, “War Diary,” Diary entry of ???. 104 Charles G. Roland, Long Night’s Journey into Day, 160. 105 Hong Kong Veterans’ Association, The Royal Rifles of Canada in Hong Kong, 1941-1945, 148. 108 Lancelot Ross, “War Diary,” Diary entry of ???. 109 Francis Martyn, “Diary of Francis Denis Ford Martyn,” LAC, Ottawa, File #MG30E 324. Diary entry: April 1945. 110 Charles G. Roland, Long Night’s Journey into Day, 101. 111 William Allister, Where Life and Death Hold Hands, 57. 112 Tom Forsyth, “War Diary & Memoirs,” LAC, Ottawa, File #MG30, E181, Diary entry: Sept. 17, 1942. 113 Phil Doddridge, e-mail correspondence between author and Doddridge dated: February 13, 2008. 114 Leon Cyr, 1986 Interview, in Gustave Gingras and Carol Chapman, “The Sequelae of Inhuman Conditions,” Appendix E, LAC MG31 J12, Volume 12. 115 Charles G. Roland, Long Night’s Journey into Day, 194. 118 Jonathan F. Vance, Objects of Concern: Canadian Prisoners of War Through the Twentieth Century (Vancouver, UBC Press, 1994. ): 184. 119 Frank William Ebdon, “Diary of Sgt. Frank William Ebdon—December 26, 1942-December 26, 1943,” LAC, Ottawa, File #MG30 E328 Volume 1, diary entry: February 24, 1943. 120 Francis Martyn, “Diary of Francis Denis Ford Martyn,” LAC, Ottawa, File #MG30E 324. Diary entry: January 16, 1942. 121 Charles G. Roland, Long Night’s Journey into Day, 216. 122 George MacDonell, This Soldier’s Story: 1939-1945, 52. 123 Francis Martyn, “Diary of Francis Denis Ford Martyn,” LAC, Ottawa, File #MG30E 324. Diary entry: December, 1944. 124 Tom Forsyth, “War Diary & Memoirs,” LAC, Ottawa, File #MG30, E181. 125 Gustave Gingras and Carol Chapman. “The Sequelae of Inhuman Conditions and Slave Labour Experienced by Members of Canadian Components of the Hong Kong Forces, 1941-1945,” Vol 2, Pt. 1, LAC, Ottawa, File #MG31 J12, Volume12, File 6. 126 Charles G. Roland, Long Night’s Journey into Day, 157. 127 Hong Kong Veterans’ Association, The Royal Rifles of Canada in Hong Kong, 1941-1945, 118. 129 Hong Kong Veterans’ Commemorative Association, Hong Kong Veterans’ Commemorative Association ‘C’ Force Memorial Wall Brochure, Retrieved on March 27, 2008 from the World Wide Web: https://www.hkvca.ca/memwall/Brochure.pdf. 130 Col. James Crawford, “Preliminary Report on a Follow-up Study of Repatriates from Japanese Prisoner of War Camps,” Department of Veterans Affairs, Treatment Services Bulletin 5:4 (April 1950): 160. 131 Walter Greg, 1986 Interview, in Gustave Gingras and Carol Chapman, “The Sequelae of Inhuman Conditions,” Appendix E, LAC MG31 J12, Volume 12. 132 William Stewart, “Prisoners in Kowloon Healthier Than Hoped,” The Globe and Mail, 6 September, 1945. Retrieved on February 23, 2008 from the World Wide Web: http://heritage.theglobeandmail.com.proxy.library.carleton.ca. 133 Dave McIntosh, Hell on Earth: Aging Faster, Dying Sooner, 242. 134 Terry Johnson, Jonathon Cote, Phillip Day & Steve Weatherbe, “The Alberta Report,” August 31, 1987, LAC, Ottawa, MG31 J12 Volume 12, “Gingras Fonds”. 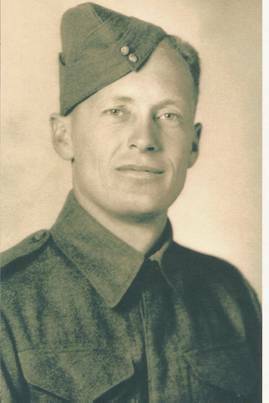 137 George MacDonell, This Soldier’s Story: 1939-1945, 100. 138 Jonathan F. Vance, Objects of Concern, 217. 139 Gustave Gingras and Carol Chapman. “The Sequelae of Inhuman Conditions and Slave Labour Experienced by Members of Canadian Components of the Hong Kong Forces, 1941-1945,” Vol 2, Pt. 1, LAC, Ottawa, File #MG31 J12, Volume12, File 6. 140 Ken Cambon, Guest of Hirohito, 101. 142 McIntosh, Hell on Earth: Aging Faster, Dying Sooner, 239. 144 Carl Vincent, No Reason Why: The Canadian Hong Kong Tragedy, 238. 147 McIntosh, Hell on Earth: Aging Faster, Dying Sooner, 252. 151 Charles G. Roland, Long Night’s Journey into Day, 324. 152 Gustave Gingras and Carol Chapman. “The Sequelae of Inhuman Conditions and Slave Labour Experienced by Members of Canadian Components of the Hong Kong Forces, 1941-1945,” Vol 2, Pt. 1, LAC, Ottawa, File #MG31 J12, Volume12, File 6. 153 McIntosh, Hell on Earth: Aging Faster, Dying Sooner, 266. 154 Clifford Chadderton, “Canada’s Hong Kong Veterans—The Compensation Story,” 1993. Retrieved on February 2, 2008 from the World Wide Web: http://www.waramps. 154 Andre Ficard, “Human-rights expert urges compensation for Canadian Pows,” The Globe and Mail, 16 August, 1993. Retrieved on March 23, 2008 from the World Wide Web: http://heritage.theglobeandmail.com.proxy.library.carleton.ca. 156 Murray Doull, “The Hong Kong Veterans of Canada, ‘Our forgotten heroes,’” The Gaspe Spec 33:44 (November 2007): 5. 157 Charles G. Roland, Long Night’s Journey into Day, 327. 158 Phil Doddridge, “Memories Uninvited,” page 44. Retrieved February 13, 2008 from the World Wide Web: http://www.geocities.com/phil_doddridge/. 159 Daniel J. MacDonald, “Gustave Gingras Political Correspondance,” LAC, Ottawa, File #MG31 J12 Volume 12, File 6, letter by Minister of Veteran Affairs, 1980. 160 McIntosh, Hell on Earth: Aging Faster, Dying Sooner, viii. 162 Bob Clayton, The Valour and the Horror, Terence and Brian McKenna (writers).